Aquarium surface area is important. This will contribute to providing superior oxygenation and facilitate the creation of an attractive aquatic theme. Height needs consideration. Marine and fresh water environments can benefit from taller aquariums, which can provide superior conditions for certain species of fish and plants. A filled, complete aquarium set-up will weigh approximately 10 pounds per gallon. 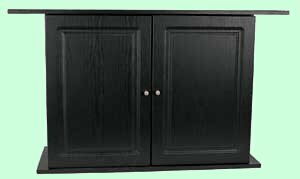 The use of a proper aquarium cabinet or stand, and verification of the floor�s capacity to support the weight, are necessary. Large aquariums should be positioned close to a supporting wall. Placing the aquarium on a bookshelf, dresser, or other household furniture is not recommended. The size of aquarium is often limited to the space available. In general, select the largest size of aquarium that space, location and budget will allow. This will provide many benefits, such as a more stable environment, greater choice of fish and plants and an enhanced aesthetic value. Two basic materials are used for aquarium construction, glass and acrylic. Glass is preferable due to reasonable cost, and superior ability to resist scratches and discoloration. Place the aquarium away from sources which will influence temperature (radiators, fireplaces, windows), create vibration (high traffic areas) and allow light entry (windows, sky lights). A conveniently located, grounded electrical receptacle is important for heater, canopy and filtration components. Select a position where the set-up can be easily viewed and appreciated. 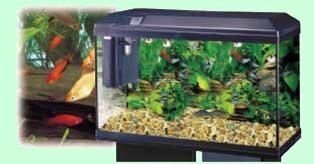 Under no circumstances should any household electrical appliances be placed under or in close proximity to your aquarium. Gently wipe down the aquarium using wet filter wool or a clean cloth and rinse with lukewarm water to clean your aquarium before filling. Never use a commercial glass cleaner, detergent or chemical cleanser to clean inner or outer aquarium glass. Never use a bucket that has been exposed to soap, detergent or any chemical cleansers to transport water for your aquarium. A mild aquarium cleaner can be used to clean inner (empty aquarium) or outer glass surfaces. A hood is required to prevent water evaporation and provide lighting. Rapid water evaporation results in a lower water level that may damage filters and heaters. It also causes a build-up of carbonates and minerals (water hardness) as water evaporates and minerals remain in the aquarium. An aquarium cover also prevents contaminants from getting into the tank. In addition, a hood will stop fish from jumping out of the aquarium. 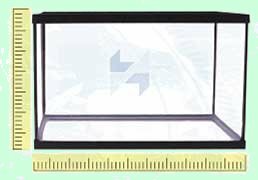 A completely closed cover has also been shown to be a major factor in maintaining aquarium temperature and keeping electricity costs down. Marina Fluorescent Canopy - has a glass seal to protect light bulbs, and an instant-start feature. 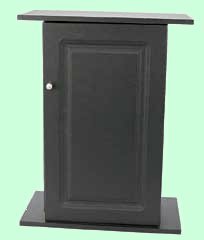 It is strongly recommended to place your tank on a stand or cabinet designed for that purpose. Before placing the aquarium, it is suggested to level the stand. Proper support for the aquarium is essential at all four corners to prevent stress along the length of the sides. Remember: an aquarium weighs approximately 10 pounds per gallon, therefore the stand needs to be solid and level to prevent breakage of the aquarium.